It's hard for me to write this post but I'm going to anyway. 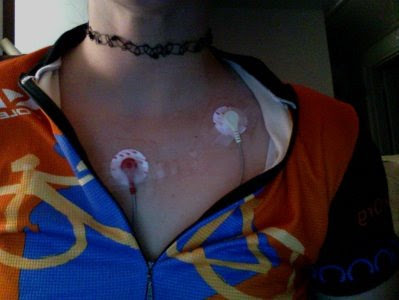 The purpose of tonight's ride was supposed to be to push my physical limits while I am wearing my 24-hour cardiac event recorder (Holter monitor). In case you don't know, it's like wearing an EEG machine for a day to record your heartrate and see how it is in your normal life, whatever normal is. At age 15 I had a then-experimental procedure called Radio Frequency Catherization Ablation. In essence, my electrical system from the AV Node of my heart is just not right- there are too many pathways for the electrical impulses to follow, so they get confused and lead to a rapid heartrate. It can occur anytime, and is more common in women. Before the first procedure, I could reach over 300 bpm sitting still. So I had the procedure, it was considered a failure- after 8 hours awake on the table, they could still induce the condition, but this time to about 180. The next year I had it again, and they could still induce me to about 150. Fast forward many many years and now I'm at a crossroad. I think it's time to go in again. The doctors told me two years ago they think I could be cured. BUT there's a small chance if they cauterize too much of the heart, they'll irreversibly damage the AV Node leading to me needing a pacemaker. Such a ridiculously scary thought. It's the kind of scary where I just think I'll live with this. Anyway, I wanted to go all out tonight so I could show the doctors exactly what I'm dealing with- my heartrate sometimes is very high while riding- we're talking just about 200, and at times it really shouldn't be. David and I were calling it the "Kill Jenni" ride because we were just going to go for it. BUT. My mind had other ideas. I was ok being in the waiting room- there was a great positive vibe among all the many morbidly obese patients. It took just a few minutes to get this on- they basically scrub your skin raw then stick electrodes all over connected to the recorder which clips on your belt. I felt happy and positive. Then as I was leaving for the ride, Gray refused to hug me- he was scared of the wires. Ouch! As I get closer to ride time, I feel my stress level increase- it's time to confront this thing that I usually ignore. We start to ride and I immediately feel I'm just not there. I want to be, but I'm not. The wires are hanging out from under my jersey to the monitor shoved in my back pocket. They kind of hurt a little- think scraping your skin with sandpaper and putting duct tape over it. I'm just not present at all, oddly silent. So ok, we get to a point and I try to go- I manage a short effort before the tears come- but I'm going kind of fast so they stream sidways. I slow, try to shake it off, and recover. In times past I have been able to channel this angst into the ride- but now, the ride is creating it. I try again, again I'm self-defeating. I am "tachy" and it's hard to shake- it's kind of like needing to break the cycle that's going on in the electrical impulse. Effort just pushes the heartrate higher than it should be and it's physically uncomfortable and not completely unscary. Passing out is a possibility, and it's happened to be twice in my life. Sometimes SVT patients requires the paddles and an electric jolt to reset the pulse. Fortunately I never have. Anyway, we get to Piermont and I ask if we can just go out on the pier for a minute- I need a mental reset. A little crying, a little laughing, a lot of reassurance, and some physical tricks to try to get the tachycardia to break (holding my breath, laying down). It seems to work, we're off. And then it was better, though a sad pair David and I were at one point, climbing a hill- I wanted to go for it, but lost my breath to the soaring pulse, David using his asthma pump. That was pretty funny. We managed to get some sprints in, I actually worked on pedaling in full circles, I practiced dropping my heels, and we did some climbing. We finished having done much less than what I wanted to do, however we also finished strong. I feel happy. And I made the mistake of riding David's bike. This is scaring the crap out of me. I want you to be perfect (kind of like me). Get this taken care of now!!! Ahem, I can only get MORE perfect. And I'm on it, ablation is in my sights, just have to get to the right doctor and get it done. Sram red you said? You get 100% Sram Red it is.